Oh this card is great! These house dies are on the way to my house as I write! Hadn't thought to use them for Halloween. Why not! So cute. Such a cute and spooky scene. Thanks for the tips on getting those windows to glow. This little scene is so adorable! How versatile those houses are! Thanks for sharing your trick about the tiny yellow windows! Love this - the 'lit up' windows are perfect! My friends and I all love this! Eeeek this is too stinkin cute!! Love the flutter of bats and your house turned out sppoktacular!! spooktacular!!! It's not a real word but I had to come back and spell it right LOL!! what a fun Halloween card.. those little bats are too cute..
Tracey, first I thought that you had used the inlaid die technique for the windows, but after reading through,I can see the yellow panel, great idea, and a very nice card. You are so clever, Tracey! I love how you created your spooky scene and still kept your card CAS! Awesome color combo, too! LOVE this card! 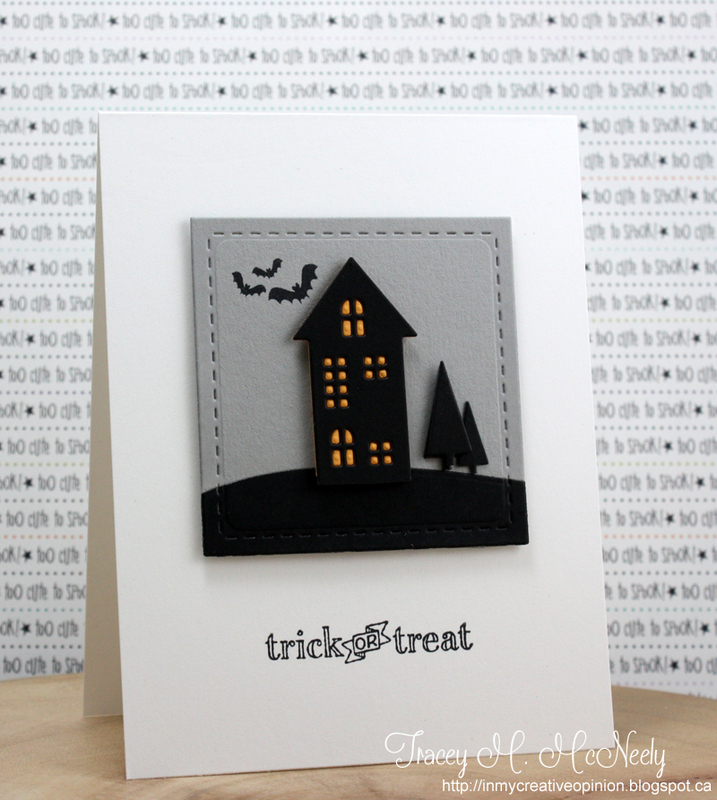 A perfect Halloween card...simple, clean and oh so sweet! I love this card! I do the tiny pieces the same way, its one of those things that you just sorta figure out. You are the queen of CAS , and that is not easy. Awesome Halloween design! I love the grey & black with the glow from the windows. 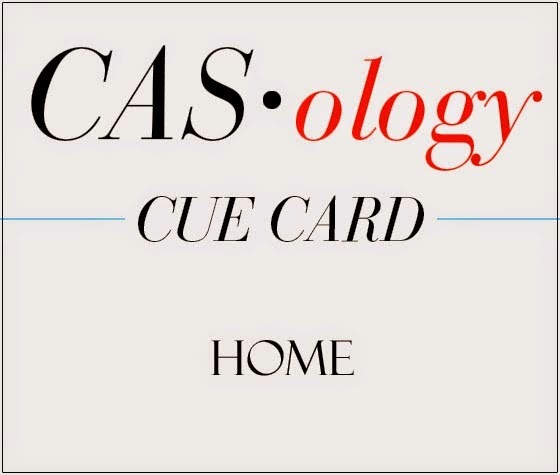 As always, a fabulous CAS card! Okay, I must say I LOVE this card, Tracey! The black and grey are fantastic together and the spooky windows are such a great pop of color!!! Tracey, what a fun haunted house! I love the "lights" in the windows...spookylicious! Brilliant! Wonderful way to 'flex' the use of this die; it's awesome as a spooky house! 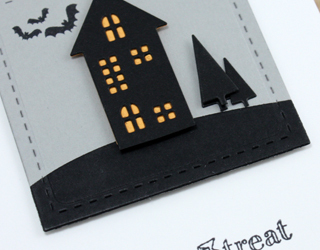 You've created a fun, yet classy, Halloween card. Fabulous! This rocks! Love the glow from the windows, the stitched frame and those wee little bats!